Home » Other » Cheap Fax Machine – best quality for the money! Today in the era of Wi-Fi, when you can send an e-mail in a second from anywhere to everywhere, who needs outdated, cheap fax machine? Ok, I get it; you desperately need one for your start-up business. You need physical, paper documentation to receive and send, you don’t have a scanner or a printer so it will replace all these devices, and you want some simple and cheap fax machine device. So, which model offers optimal quality for the good price? You are on the right spot! American fax machine Brother Fax-575 with a price of approximately $40 is definitely cheap fax machine, one of the cheapest on the market. It’s a great choice for personal use at home and for a small office or business. Brother Fax-575 is simple, compact and small so it won’t occupy lot of space and it’s very easy-to-operate. It works seamlessly with most home telephone configurations. You can put fax and voice calls on a single line, and in this way you save money because you don’t have to have two separate lines. However, if you want, it has a built-in interface which so you can connect an external answering machine. When buying this fax machine, the device has assembled print cartridge for a small number of pages (about 30), but when you run out it’s very easy and cheap to change it. The new print cartridge costs around $20 and it’ll last for 150-200 pages. Handling with paper is also fool proof. Brother Fax-575 includes a 50-sheet paper input capacity and 10-page auto document feeder capacity. You don’t have to buy any special, expensive kind of paper, just a regular one, and the cheapest. Fax modem is relatively fast (9,600 BPS), it transmits one page in about 15 seconds. It’s not very ‘clever’; it has only 512 KB of memory, which imply storage of maximum 25 pages. But you can use it to make black-and-white copies with up to 400 x 400 dpi resolution. One of the minuses is that the thermal-transfer ink doesn’t last too long. 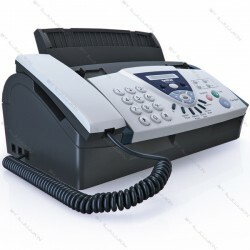 In resume, Brother Fax-575 is certainly cheap fax machine and it will be good for you if you don’t need to send and receive a dozes of faxes daily. Brother Fax-575 is not build for a large amount of work, it will be your lazy co-worker because it has slow faxing speed, but it will be really efficient if you need it to work just a few times a day. If you, by any chance, have a double amount of money and you are skeptic about buying really cheap fax machine, you will be much satisfied and happier with Canon FAXPHONE L100 Laser Fax Machine. 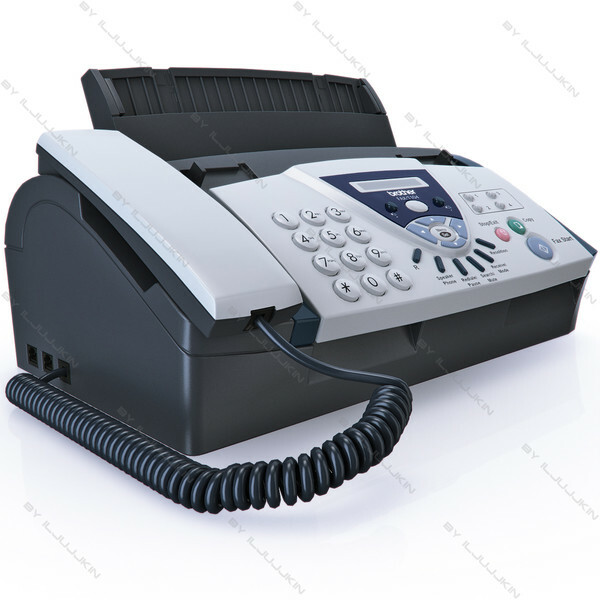 With much modern design, the Canon FAXPHONE L100 Laser Fax Machine is also created for home or small office use but it consolidates a laser fax machine, laser printer and digital copier into one quality machine. It is much faster faxing (19 page per minute), the 150 sheet capacity, it has better copier function, bigger memory (512 page), 30-sheet automatic paper feeder, 30 speed dials, and in the bottom line, it’ll save your money on long run. This is not a cheap fax machine but its smart Energy Saver Mode reduces your power consumption to approximately 1.4 watts of energy and the product meets Energy Star guidelines, helping you save money on energy costs.